They did things. They said things. They made things. They changed things. But what? 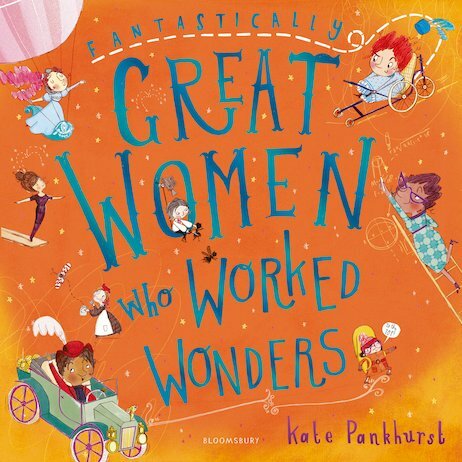 Meet thirteen incredible women who shone in the world of work in this vibrant new book by the wonderful Kate Pankhurst. There’s Junko Tabei, the first woman to climb Everest. There’s Maria Merian, a naturalist and painter whose dazzling pictures of flowers and bugs still captivate viewers 300 years after her death. There’s daring hot air balloonist Sophie Blanchard, and Lottie Reiniger, famous for her beautiful shadow puppet films. What about you? What do you dream of being when you grow up? Featured women: Junko Tabei, Sophie Blanchard, Maria Merian, Elizabeth Magie, the London Matchgirls, Rosa May Billinghurst, Katherine Johnson, Annette Kellerman, Katia Krafft, Rosalind Franklin, James Barry, Madam C.J. Walker, Lotte Reiniger.